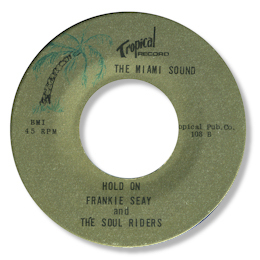 If anybody reading this will have heard of Frankie Seay it’s a dollar to a penny it’s because of the instrumental pairing “Soul Food” / “Black Jack” which features his group the Soul Riders. But there’s more to this Miami artist than this disc. Hold On is a fine deep soul piece with a typical “little label” feel to it – raw and uncompromising. Seay really gets into the lyric particularly towards the run out groove. The flip is a good mid paced companion to this track – the horns are especially tasty. His final 45 for Tropical features a raucous uptempo workout entitled “All I Want Is You” plus a stop-go James Brown influenced “Baby Please” that is really enjoyable. The only other disc I know by this vocalist is an 80s effort for his own Sawax label “Everybody On The One” which doesn’t really have enough to differentiate it from any of the thousand other uptempo synth laden songs of the period. "Frankie Seay was in trouble in the 80's when he undertook some live gigs ... this was because he was accepting live bookings under the name of one of the many versions of the Ink Spots that were performing across the States back then. The original Ink Spots rhythm-and-blues quartet has not been together since the 1930s, and all four of those musicians were dead by the 70's. But the many versions of the old group refused to fade away. The original breakup of the Ink Spots in the 40's had led to more, not fewer, neo-Ink Spo groups. "In the last year, we have sent letters to 10 other groups in Florida asking them to stop using the name," said Mili Della Lilley in 1985. As president of the Hanover Group entertainment agency in Fort Lauderdale and personal agent for Jim Nabbie`s Ink Spots Inc. she insisted that she managed the single honest-to-goodness, one-and-only, real-McCoy Ink Spots. Or at least the closest thing available at that time. Jim Nabbie`s Ink Spots filed a lawsuit against some other Ink Spots who have been performing around FLORIDA. Named as defendant in a Broward Circuit Court civil suit was Frank Seay, leader of a group that at various times has called itself Ink Spots `82, the Fabulous Ink Spots, the Great Frank Seay and His Ink Spots, Ink Spots `81, The Ink Spots, and the Great Frank Seay and the Super Spots. The situation was very confusing. Even Frankie's attorney, Jerome L. Tepps, has had to take a crash course in music history to play this particular game of To Tell The Truth. "I think Jim Nabbie is one of the original Ink Spots," Tepps said. "My understanding is that he`s as close as anybody can be to being the real thing while being alive. He`s not one of the original four," Lilley agreed. "They`re all dead. They would be in their 80s if they were alive." According to Lilley, Deek Watson, who was one of the originals, brought Jim Nabbie into the group to replace Bill Kenny, whose mezzo soprano voice was considered the distinctive signature of the group. Kenny made the group famous for such big hits as If I Didn`t Care, We Three, and I Don`t Want to Set the World on Fire. But even Kenny was not an original Ink Spot. The first four members, who began singing in the late 1930s, were Watson, Jerry Daniels, Hoppy Jones and Charlie Fuqua. The Ink Spots have always been abundant in splinter groups and imitations. According to a United Press International news story in 1966, at least 10 groups by that name were performing at that time in North America. The group Lilley represents is composed of Nabbie, 65, who lives in Atlanta; King Drake, 64, Palm Beach; and Harold Winley, 52, and Sonny Hatchet, 53, both of whom live in New York. According to Tepps, Frank Seay`s Ink Spots have agreed to drop their name, meaning Tepps probably will not have to pursue his lawsuit. In addition to taking bookings under the name of Frank Seay & Contact High, it seems that around the mid 1970's, his group also started going out as the Ink Spots. Whilst they got good reviews under that name & attracted an 'older audience', they would perform more contemporary songs if faced with a younger audience. Francie & the group sought to legitimise themselves (as the Ink Spots) by stating that Frankie (& his brother Eddie) were the nephews of 1960's Ink Spot Joe Boatner and that they had earlier performed with Joe. They also had Billy Mack as a group member at times and he had also been in a few 'incarnations' of the Ink Spots at times. 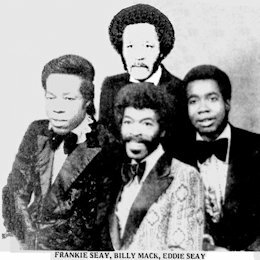 The line up of Frankie's Ink Spots in 1975 was Frank & Eddie Seay, Billy Mack and Joseph Palmer but members came & went right through to the mid 80's. In 1975, the group were being booked right across Florida with one big gig being a week long engagement at the Sheraton Cyprus Gardens in Winter Haven (between Tampa & Orlando). Frank only sang lead on a few of the group's songs, Billy Mack & Joseph Palmer having voices more suited to the old Ink Spots favorite tracks. Frank sang lead on more of the contempoaray songs the group performed. Eddie Seay mainly played guitar for the group (though he did contribute some backing vocals). Other musicians that they toured with (as their backing band) included Oscar Williams & Leon Butler. I believe that some of this whole ensemble had been performing with Frankie for some years by 1975. It seems unlikely that Joe Boatner approved of Frankie's version of the group. However as Joe had been performing (with his own incarnation of the Ink Spots) up in Maine & Canada since at least the late 40's and was still securing regular bookings for the group through the mid 70's and into the early 80's." John also provided the excellent picture. I'm also very sad to report that Frankie passed away in a nursing home from pancreatic cancer on 27 October 2012. Thanks to Faith Benghiat for this sad news. Note ~ “Soul Food” can be found on the Jazz Man CD “Florida Funk”. Thanks to Bosko Asanovic for an addition to the discography - I'm always grateful to him for sharing his vast knowledge.